Gifts From Gavin: 4th Annual Gifts From Gavin Toy Drive! 4th Annual Gifts From Gavin Toy Drive! 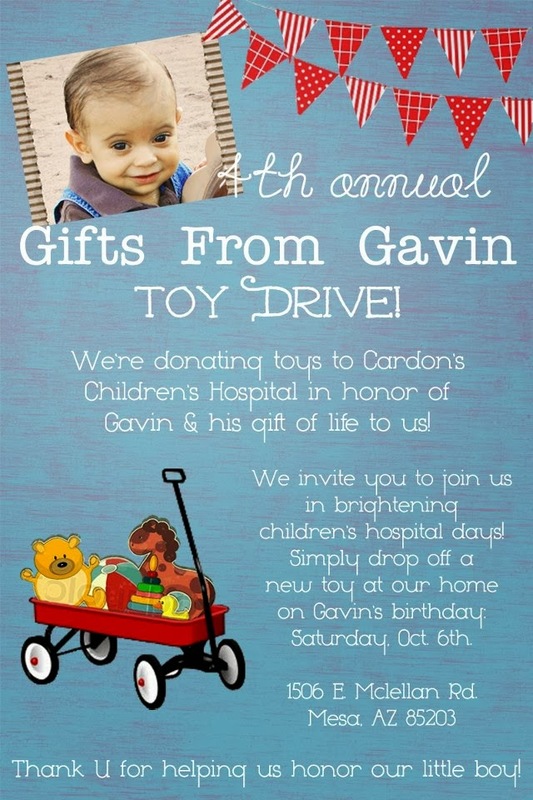 Our family is excited to kick off our yearly tradition in honoring Gavin, and his gift of life to us, in celebrating his birthday by collecting new toys to donate to Cardon's Children's Hospital, where our sweet little Gavin spent so much of his short life. So many people there became like family to us, and in a way, it became a second home to us, too. Those walls hold a lot of sacred memories of moments that we spent together as a family with Gavin, and we'll always feel it in our hearts when we go back to visit. Having spent so much time there, we realized how HUGE of a difference it can make to these babies and children to have just one little moment of normalcy and happiness in their day. The hospital is a scary, scary place for children (well, for their parents, too! ), but especially for younger children who don't understand WHY their mommies and daddies are keeping them in this unfamiliar place, where strangers poke and prod at them, and worse stick them with needles and tubes and hurt them, over and over, every single day. They don't understand why they can't go outside, or leave this strange room, or in most cases, even their crib or bed. There is nothing in there to brighten their day, until they get to go to the toy closet (or have it brought to hem!) and they get to pick out a new toy!!! Seriously, its the best thing ever to see the look on their face when they see all those shiny, fun possibilities. Its not something you can really convince anyone else of, until they actually live through it. But a silly $2-3 toy can bring your child, and you, hope that seemed to not exist only a few minutes before. Because when you watch your child being held down and being hurt as they scream and cry and reach out for you, and their face is puffy and red with tears streaking down their face and they look at you with betrayal in their eyes...you want to just die. But all it takes to wipe that away, is to bring them to the toy closet, and suddenly, all is forgotten, and their world evens out, stops spinning, and becomes 'normal' even for just a little while. And seeing them smile, after all the pain and horror, is priceless. A mother in my ward approached me recently and, with tears in her eyes, relayed her experience the month before in the hospital with her daughter. They had been there for an extended time, and I'm sure, felt that horror and shock that offends all of your senses and makes you feel like you're in a war zone. And then, they took her daughter to the toy closet, and she just....got it. She understood it how much it meant. And that meant SO MUCH to me! It doesn't make me happy that they had to experience it first hand, but I'm glad that the toys were there. That we had some small part in making their hospital stay a little less traumatic and awful. So, it brings us so much joy and peace to fill up our vehicle with piles and boxes of those shiny possibilities, those little rays of hope, those smiles that are seldom earned...and present them to the place, and the people, who made such a huge impact on our lives. So in honor of Gavin, and his gift of life to us, we hold a toy drive every year on his birthday. We take the money that we would have spent on a birthday party and toys for Gavin, and we use them to buy toys to donate to the children at the hospital. And we invite you to join us in brightening these children's hospital days, by donating a new toy, too! ** Last year we donated 120 toys...I'd love to make that 150 (or even 200?!) this year! Or, if you're out of town, you can order a toy online and have it shipped to our address (I recommend Amazon so you can get their free shipping, if possible!). Just send me an e-mail and let me know to watch out for it. You can also make a monetary donation online through our paypal account to my e-mail address, bethany.at.bethandre.com. Just write "Gifts From Gavin" in the info box. Again, all proceeds will be used to buy toys from the Mattel Charity Catalog. **I know there's not a lot of room in everyone's budget for extras...so please don't think a toy has to be BIG or PRICEY to make a child HAPPY!! Sometimes the smallest, simplest toys are the most FUN!! Even a 35 cent matchbox car is HEAVEN to a 3 year old who's been stuck in bed all day long. And $1 adds up fast when its joined with all the rest. We are equal opportunity acceptors of toys and donations! ;) The last thing I want to do is burden anyone or have them feel bad!